This delicious, and surprisingly easy, copycat Zupa de Toscana soup recipe is my all-time favorite soup. 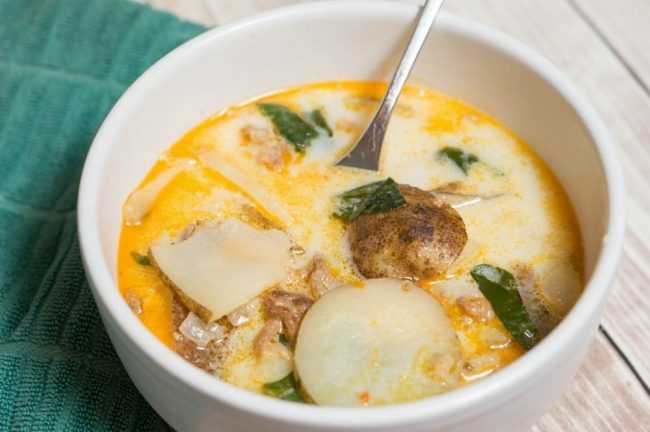 It’s creamy, delicious, and packs a ton of flavor! Best of all, it’s really easy to make and very filling. It’s one of the few meals in my home that not one of us complain about! compensation. All opinions are my own. We cook everything together in stages in our Kitchen Fair 8 qt Dutch Oven. 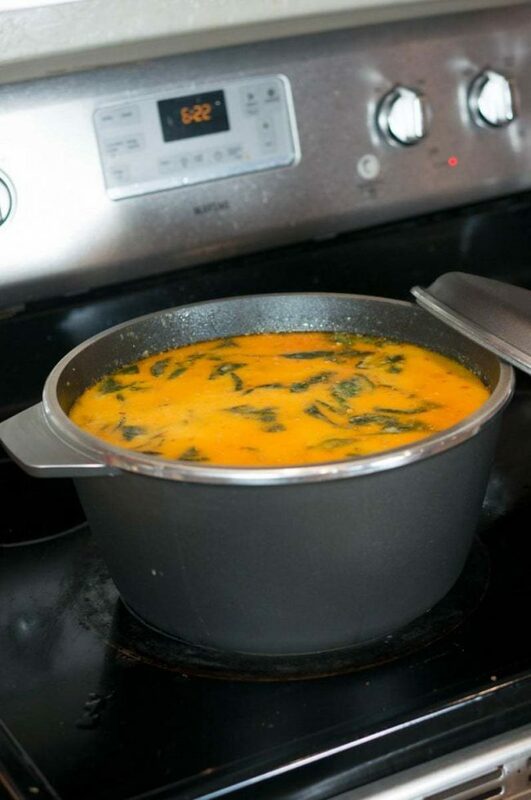 It’s a HUGE pot that is perfectly sized for preparing our Zupa recipe! Start by frying up the bacon, then remove from the pot and set aside to cool. Next, fry sausage together with garlic paste and crushed red pepper. When browned, add in onions and cook until onions are translucent. Add water and chicken bouillon. You’ll need at least one cube (or equivalent if you choose chicken stock) per cup of water, or more. We like to add a little extra chicken bouillon for a stronger flavor. Bring to a boil. Slice your potatoes into really thin slices, au gratin style while you’re waiting for the soup mixture to boil. 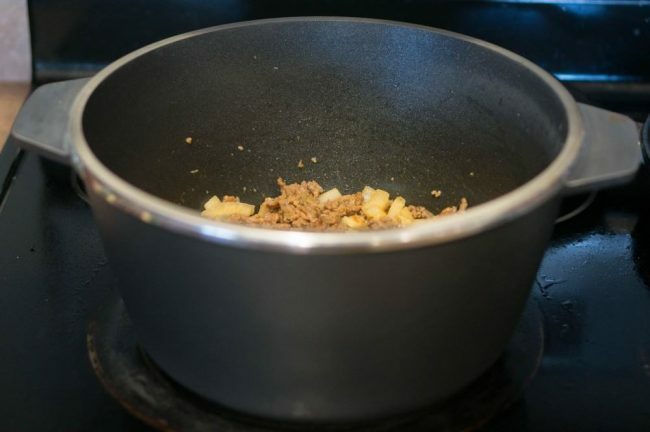 Crumble up the cooled bacon and sliced potatoes to the pot. Continue to cook until the potatoes are done. Add in the heavy cream and stir to combine. Just before serving, add in spinach. 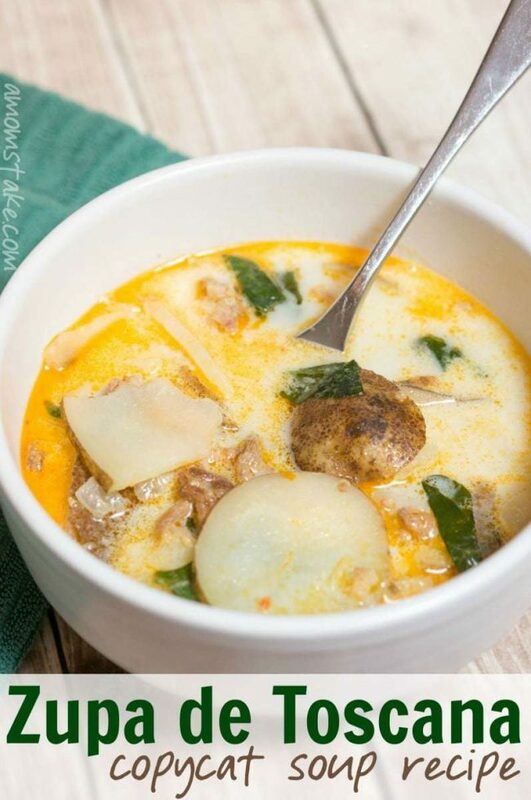 This soup is creamy, flavorful, and so good that we all asks for seconds! The recipe serves approximately 10 servings (enough to feed a family of 8-10 or enough for about 6 adults). Add water and chicken bouillon. You'll need at least one cube (or equivalent if you choose chicken stock) per cup of water, or more. We like to add a little extra chicken bouillon for a stronger flavor. Bring to a boil. Slice your potatoes into really thin slices, au gratin style while you're waiting for the soup mixture to boil. If you make soups, or large portions, often you will want to invest in a Kitchen Fair 8 qt Dutch Oven. It’s the most versatile pot we own. Kitchen Fair makes all their cookware products right here in the USA with a focus on quality and durability. The Dutch Oven is part of their classics line formed with a thick cast aluminum construction that provides incredible heat retention. 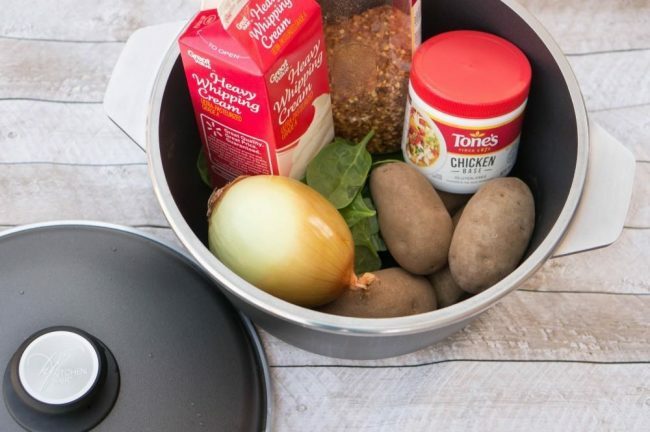 You can take the dutch oven from stovetop to oven and it is dishwasher safe! I haven’t had to run it through the dishwasher, though, as the non-stick interior is so easy to clean! They use a patented non-stick coating that is 10x more effective and providing a non-stick solution than the nearest leading competitor! Plus, the coating is completely non-toxic and PFOA free, meaning it’s completely safe – even when you’re cooking at high heats! All Kitchen Fair products are sold through independent consultants through social shopping, which means when you fall in love with the products, you can even turn it into a home business that gives you flexibility and income! Or, you can host a party with your friends and family and earn your favorite Kitchen Fair products for free or at a discount! Visit KitchenFair.com to learn more about their products and to find a consultant near you. I’ve never heard of this before but man does it look good! Thanks for linking up with Delicious Dishes Recipe Link Party! I LOVE this soup. Our youngest son came up with a version that is so delicious, but it’s in his head. I’ve got to get him to write it down and in the meantime, I’m making your version! My family isn’t big on soup, but I love it! I’ve never had this kind before and can’t wait to try it. So glad it’s easy to make and I’ll get it all to myself! That’s one of my favorite soups! I can’t wait to try out this recipe & be able to have my favorite whenever I want it. Very nice cookware. I use my Dutch oven all the time, especially for preparing soup. Your recipe sounds scrumptious. We enjoy all of those ingredients. Thanks for sharing at Merry Monday. Pinning your recipe. Oh my, this soup is the best! I haven’t tried making it but I sure will now. Looks so yummy! This looks really yummy, I love the idea of making this recipe at home. I bet it would be a hit! That looks heavenly! Im not sure you can ever go wrong with bacon and heavy cream!